A few days ago, I was about to start shaving when my 6 year old daughter (Lucie) entered the bathroom. She wanted to discuss our upcoming day together, but quickly started asking me questions about shaving. Every step of the way, she asked me what I was doing, what my objective was, why I used a particular tool or product, etc... She also asked me to explain or clarify what she didn't understand. (She also told me every time I missed a spot.) 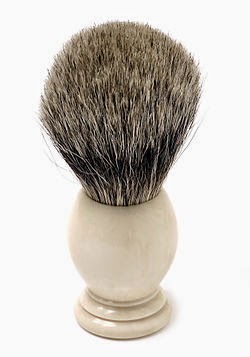 I use a shave brush, and so the process is slightly more involved than with a can of shaving cream - she also wanted to know why I prefer the brush. Of course, shaving is not something I spend a great deal of time thinking about: I do it on autopilot, in the morning, sometimes while half awake and mostly while thinking about something else. Her questions forced me to consider my shaving process step by step, and to find a reason for everything I was doing.